Airport traffic data presented in an interactive visualization, updated through 2017. Since 2014, passenger traffic at the Wichita airport is slightly higher, while rising sharply for the nation. 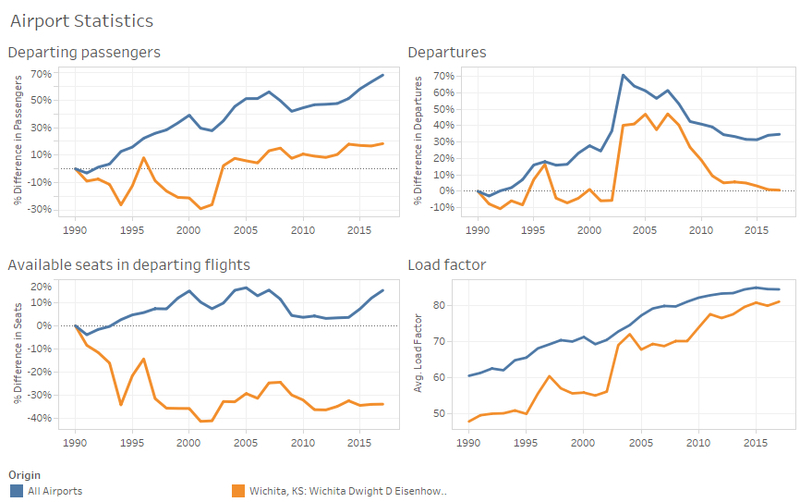 The number of departures has been declining in Wichita, while level and now increasing for the nation. The number of available seats on departing flights from Wichita has been mostly level, while rising sharply for the nation. To view and use the interactive visualization, click here. Example from the visualization, showing Wichita compared to all airports. Click for larger.